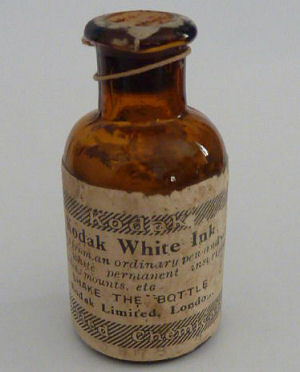 Small bottle of Kodak White Ink made by Kodak Ltd London. 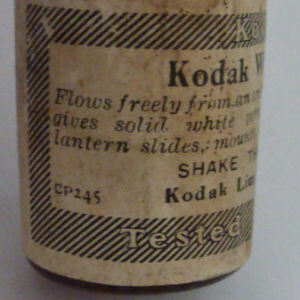 A small bottle of 'Kodak White Ink' that "flows freely from an ordinary pen and when dry gives solid white permanent inscriptions on lantern slides, mounts, etc." 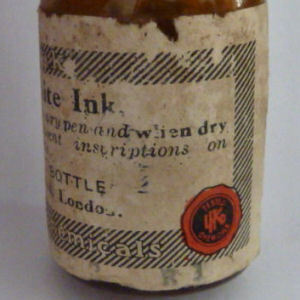 Bottle approx. 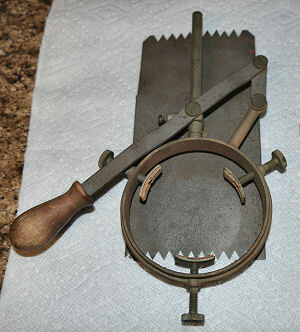 2.5 inches high, with a cork stopper. 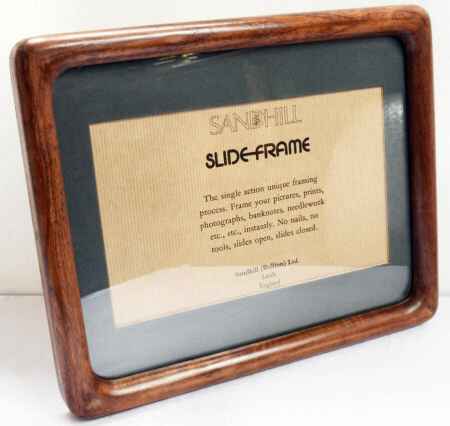 A teak wooden Sandhill slide-frame. 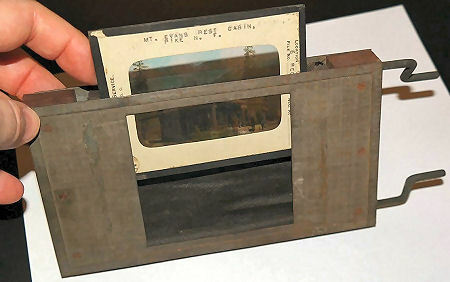 The end section slides out to allow easy entry/removal of contents. 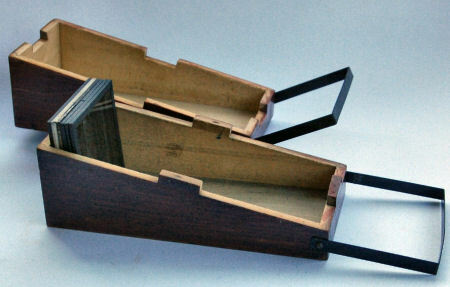 The outer dimensions are 28 x 23 cm and the inside is approximately 25 x 21 cm. 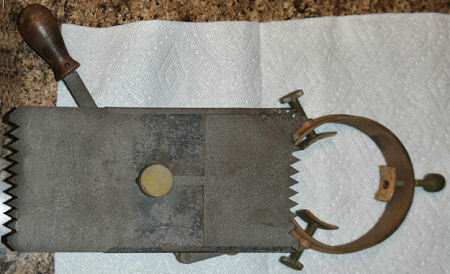 Shutter mechanism for magic lantern or enlarger. 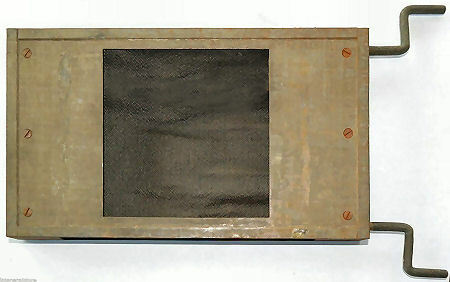 This early shutter is quite large. 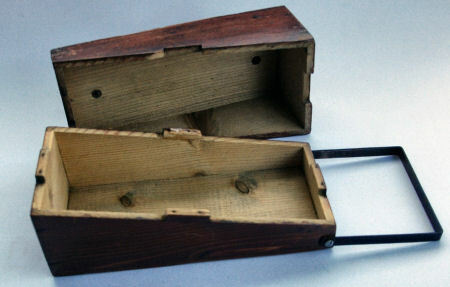 The body is circa 31,75 cm long by 15 cm tall so only few lanterns can handle it. 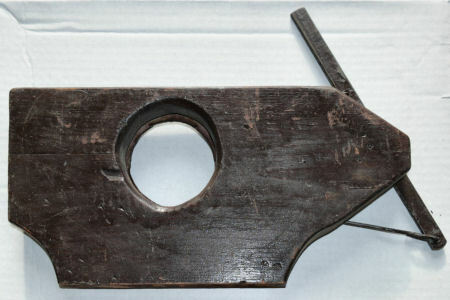 The lever mechanism is rather simple; it contains two over each other sliding metal plates that move from a complete closed hole in the middle for complete darkness, to being opened to the position where the circle is completely open. In magic lanterns better results are obtained when the lever is moved slower than in the animation. 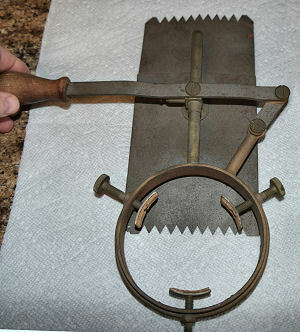 Made of metal and wood with no makers name. Equipped with a brass clamping ring that can be attached to the front of the projection lens. 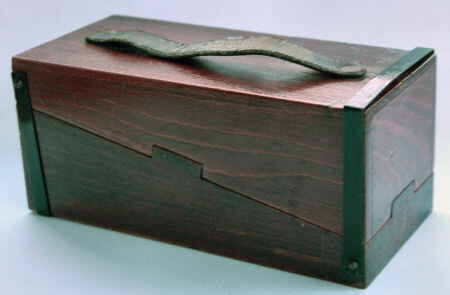 The light is gradually shielded by pulling the handle. 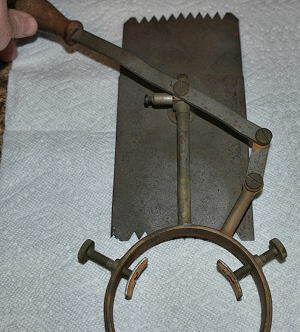 Obviously a second clamping ring had to be attached to the other end of the rod, so that a dissolve of the image from one lantern to that from the other could be made at a biunial. 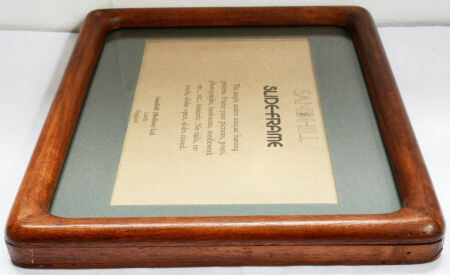 made by William Butcher & Sons Ltd.
For storing square magic lantern slides of 8.3 x 8.3 cm. A projection device creating impression of falling snow or rain. 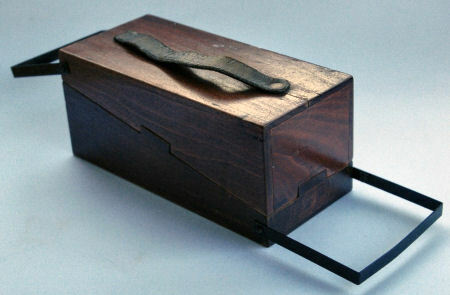 The central square contains a blackened flexible material pierced with tiny holes. 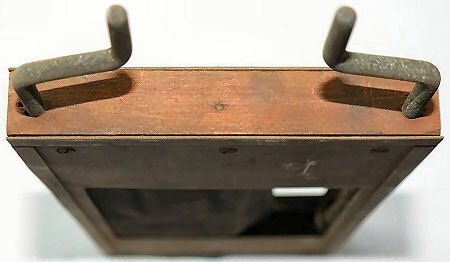 Both cranks move when you are moving one so the curtain rolls up or down depending on what crank you use and the direction you are turning them. This popular superimposed snow effect can be combined with a lantern slide of a winter scene that can be placed in front of the curtain.